It’s really tough to choose what toddler toys and games are appropriate for a preschool boy’s gift? Will it stand up to his rough play and will he be entertained or educated by it? These are questions that run through the minds of every parent, grandparent, aunt, uncle and friend who wants a gift for that favorite little boy. Many toys look like they are for a certain age group, and yet there are small parts that could still pose a choking hazard, or, in some cases of the very rambunctious child – throwing hazards. Having a little bulldozer for a nephew, I had to start looking around for something I would feel assured was a good gift choice for him, and his parents peace of mind. The choices are endless, trucks, workbenches, dinosaurs, airplanes and many old favorites that are still around that I remember from when my older children were his age. What preschool boy wouldn’t LOVE to play with the Step2 Deluxe Workshop for hours and hours? This large workbench stands 34 x 15 x 40.8 inches; and weighs 32 lbs. It is big enough for more than one boy to play at a time. 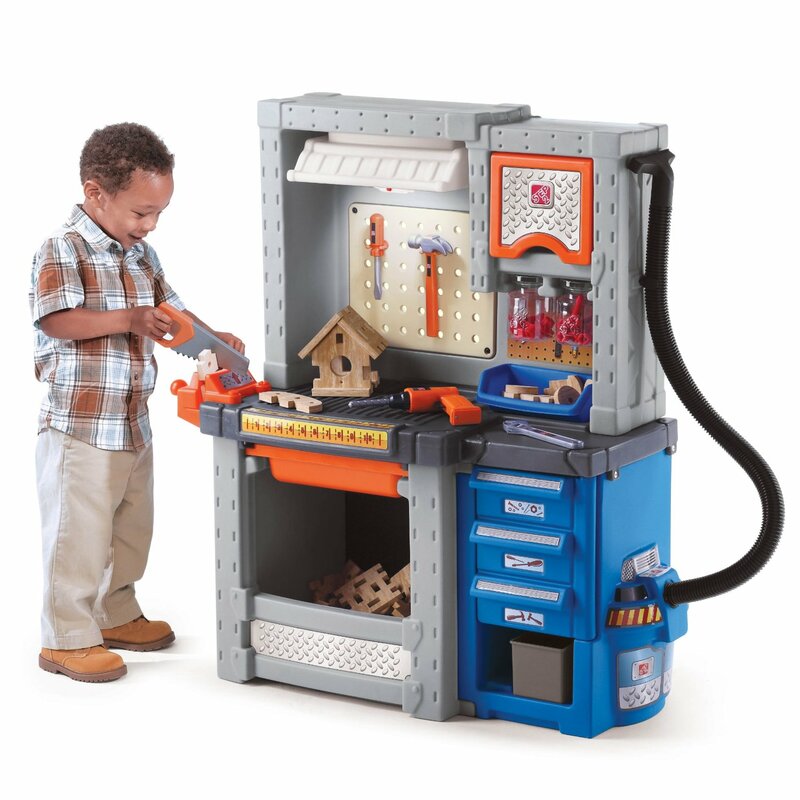 It features large work surface for the little builder who loves to work on projects just like Daddy or Grandpa. A great introduction for any little boy to the world of building and creating with realistic looking accessories. There is a 50 piece accessory set that includes an electric drill, 2 drill bits, 8 screws, 8 nuts, a saw, hammer, pliers, adjustable wrench, screw driver, 17 “wood” pieces, plus bins and jars for storage, spring action vise and pretend shop vac. The realistic-looking “wood” is made from indestructible Durafoam which allows children to build creations while using their imagination, plus this workbench come with Instructions for 4 projects to kick start his imagination. Step2 Deluxe Workbench Features: 50pc Accessory Kit, tool chest looking cabinet, slide in/out drawer, parts bin and hanging jars for storage and easy clean-up, it also has realistic working overhead shop light (requires 3AAA batteries not included) and battery-operated drill has realistic sounds and interchangeable drill bits for maximum realism (2AA batteries not included). This LEGO Duplo Train Set is steamed up for hours of fun! The LEGO Duplo Legoville Deluxe Train Set is any little engineer’s perfect setting to keep his imagination moving down the tracks. When the tracks are assembled, this large set provides plenty of access to multiple areas of the train and accessories so its great for multiple toddlers to play, add the motorized train and its 2 wagons chugging around the tracks to the warehouse will provides hours of fun. Included in the LEGO Duplo Legoville Deluxe Train Set (5609) is 30 tracks (9 straight, 20 curved & 1 crossing) a conveyer belt and crane with loading functions, 3 Duplo figures for a total of 116 pieces in the box. This deluxe cargo train set with everything your little preschool engineer needs to chug through the playroom. The train’s cargo wagons can be loaded and unloaded at the warehouse using the conveyor belt or using the big loading crane. Fuel it up at the petrol station and listen to the real fuel pumping sound. The set requires 3AA batteries, not included. This may be the perfect starter train set for your little boy. It can be operated by him with the included remote control, but can also be manually pushed along the track – so all the fun doesn’t end when the batteries die. GeoTrax has become a favorite of little boys, because the set is compatible with other GeoTrax sets and can be expanded to include more elaborate set ups. It measures 33.5 x 40.5 x 11 inches and weighs 9 lbs. and customers give it a solid 4.5 out of 5 stars from 120+ reviews. The most helpful comments spoke of the trains’ durability, expandability, ease of use, and hours of enjoyment for their children or grandchildren. The durability of wooden toys has long been appreciated by parents around the world. This Melissa and Doug Deluxe Wooden Railway Set is a great way to encourage your little boys creativity and expression, with a train set that can stand up to any abuse he can give out. Designed for children ages three and older, the set includes easy-to-follow instructions for four different track configurations, giving children hours of playtime as they build the perfect layout. Nowadays, kids seem to be born with a computer chip in them, and these are some top rated and best selling electronic toddler toys any boy would love to play and learn with. These Remote Control Vehicles are from Kid Galaxy the world’s most creative RC company. They use a unique steering wheel style remote and the chunky shape makes them perfect for little hands.